For a while I felt Angel Haze and Azealia Banks were pretty neck and neck for the crown of cool girl rapper (and my luv). Then Iggy Azalea stole everyone's thunder by spelling her name over and over again, and the battle seemed a moot point. Yet, over the last several years, these two managed to remain interesting, albeit in verRRRy different ways. Azealia Banks, singer of the greatest song of 2011, singlehandedly murdered her own career thru twitter wars with Perez Hilton. (Isn't that the saddest sentence ever typed). 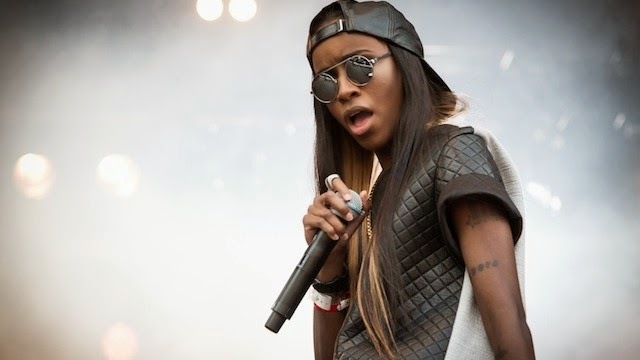 Angel Haze on the other hand, worked with rando yet interesting people and kept my interest. This song is pretty amazing, and shows up for like 4 seconds in 22 Jump St. Nacey provides a scary yet catchy beat, and Angel Haze raps with the ferocity of Patrick Bateman. Ultimately, when I listen to it I am afraid she's going to light me on fire. In a good way.